HOMAGE TO THE EXALTED ONE WHO PROTECTS FROM HARM. I too generate the Mind of Awakening. As numerous as sand-grains in the River Ganges. And Great Ocean of Godly Pure Conduct. And humans shall come to be powerfully pacified. Serve to protect, with intense joy. As well as fruit and flowers shall increase. And in particular there will be auspiciousness for children. And even demons will do no harm. And be without illness and far from plagues. And become good fortune itself. Vajrapāṇi, to you I bow. Its powerful impartment has thus been spoken well. Humans shall be liberated from poverty. And shall live on to a hundred. There is thus no doubt about the power of dominion, as well. THE ONE HUNDRED AND EIGHT NAMES OF JAMBHALA ARE COMPLETE. Translated from the Tibetan by Erick Tsiknopoulos during late December 2013 and early January 2014, in McLeod Ganj, Dharamsala, Himachal Pradesh, India. Updated and revised in early August 2016. Heartfelt thanks to Gen Lobzang Gyatso of Esukhia Nangten Sizhukhang and Drépung College, who provided the indispensable commentary and explanation of the text. The Tibetan text used was the one found in the edition of the Zungdü (gzungs-‘dus) published by Sherig Parkhang, Dharamsala. Special thanks to Ned Branchi for his invaluable help with the Sanskrit, mantra, and editing. By the positive karmic potential of this translation, may all beings quickly be freed from the grip of greed, miserliness and stinginess, and become just like Jambhala, generous to all. ‘Exalted Jambhala’: ‘Exalted’ (Skt. ārya, Tib. ‘phags-pa) indicates that Jambhala is a being who has attained the Path of Seeing (Tib. mthong-lam), the third of the Five Paths (Skt: pañca-marga, Tib. lam lnga) ascending to enlightenment (bodhi), which in the Mahāyāna context of this text means that he is a bodhisattva abiding on at least the first bodhisattva level or higher (Skt. bhūmī, Tib. sa), which entails having had a direct non-conceptual realization of emptiness (Skt. śūnyatā, Tib. stong-pa-nyid); that is, seeing (Tib. mthong) the Truth of the Path (Skt. marga-satya, Tib. lam-bden). ‘One Who Protects from Harm/Detriment’: A literal translation of the Tibetan gnod-‘dzin, here interpreted to mean ‘safe-guarder (‘dzin) from harm (gnod)’ or ‘protector from detriment’. It is very similar to the Tibetan term for yakṣa, gnod-sbyin, literally ‘harm (gnod) giver (sbyin)’, and undoubtedly signifies another type of yakṣa, although the precise relationship is unclear. Generally speaking, the Tibetan rendering of yakṣa, gnod-sbyin or ‘harm-giver’, was definitely not a literal (nor necessarily accurate) translation of the Sanskrit term yakṣa, and the Tibetan gnod-sbyin was quite possibly a rather arbitrary designation used as a simple way of classifying a kind of Indian supernatural being mentioned frequently throughout Buddhist texts. This fact also calls the meaning and translation of gnod-‘dzin into question, especially since the original Sanskrit correlate of gnod-’dzin is unclear. However, in this text, apart from issues with its relationship to gnod-sbyin/yakṣa, gnod-‘dzin is evidently being used to describe a positive quality. Thus ‘protector from harm/detriment’, a literal translation, seems reasonable, although further research into the aforementioned is necessary. Based on the context in which it is used in this text, it would also seem that gnod-‘dzin is a more exalted or higher-status variety of yakṣa, indicated linguistically by the difference between the verbs used, sbyin and ‘dzin respectively, the first implying a more wrathful kind of being (‘harm giver’), and the second a more benevolent one (‘harm guardian’). The history of yakṣas is quite complex, and they have had various roles in the history of Indian religious traditions, since before the time of the Buddha. In Mahāyāna Buddhism they are generally portrayed as very powerful celestial beings who are somewhat volatile and militaristic, yet often inclined toward virtue and practicing the Buddhist teachings. They are perhaps somewhat like the demigods or asuras, except in that they seem to be praised as more capable than asuras of virtuous acts, such as protecting Buddhist teachings and helping their practitioners, having far-reaching miraculous abilities, and even attaining high levels of enlightenment (bodhi) and becoming bodhisattvas, such as here with Jambhala and his ‘father’ Manibhadra, or the yakṣa ‘general’ Susambhava in the Sūtra of Golden Light (suvarnaprabhāsottamasūtrendrarājaḥ-sūtra). ‘The Mind of Awakening’: Skt. bodhicitta; the mind which aspires to attain the complete awakening or full enlightenment of Buddhahood for the sake of all sentient beings. ‘Son(s) of Manibhadra’: Manibhadra (Tib. nor-bzang) is one of the foremost yakṣa leaders, as well as a wealth god. He is featured in the Dhāraṇī of Manibhadra as found in the Kangyur (bka’-‘gyur, the Tibetan Buddhist canon translated from Indian languages); a translation of this text can be found on the Sugatagarbha Translations website at www.buddha-nature.com. 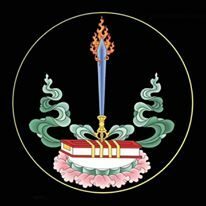 In the present text, Jambhala is presented as being the son of this famous wealth-giving yakṣa (Tib. nor-bzang (gi) sras). It would seem that Jambhala is the foremost among a certain class of beings constituting Manibhadra’s sons, who are referred to later in the ‘Benefits’ section of the 108 Names as ‘the sons of Manibhadra’, one among of a number of classes of gods and yakṣas who protect anyone who reads the Names. Like his son Jambhala, Manibhadra also seems to be exalted (Skt. ārya, Tib. ‘phags-pa) as a bodhisattva. ‘Giver of the Supreme, Gnome, Pervasive Penetrator’: The first of these epithets, ‘Giver of the Supreme’ (Tib. mchog-sbyin) is another poetic name for Vāyu or perhaps Vāruna, Indian gods associated with wind; the second and third are poetic names for the god Viṣṇu. This would seem to indicate a connection between these gods and Jambhala, probably in terms of some of their shared qualities and characteristics. ‘Gnome’ (Tib. mi’u-thung, literally ‘short person’), usually refers to small emanations of powerful gods, such as Viṣṇu in particular, which are short in stature but mighty in magic, something perhaps akin to ‘divine leprechaun emanations’ of sorts. The term mi’u-thung can also generally refer to various gnome-like, diminutive magical beings, and in more common usage to dwarves or midgets. ‘Pervasive Penetrator’ (Tib. khyab-‘jug-pa) is one of the most frequent Tibetan names for Viṣṇu, and even more so for his devotees, the Vaiṣṇavas.